This card has a lineup of perks that is hard to match, whether you're wanting to earn points on essential purchases or get out of debt faster with a 0% intro APR offer. One of the few remaining balance-transfer cards that include an intro $0 balance transfer fee. Add in the premium rewards and welcome bonus, and it's hard to ignore. If you’ve accumulated credit card debt, balance transfer cards are the best way to get some relief from those hefty interest rates as you pay down what you owe. While most balance transfer cards charge a 3% fee for every transfer, the Amex EveryDay® Credit Card is a rare exception. The balance transfer benefits are a key selling point of this card, but it can also earn you solid rewards on your spending. 0% intro APR -- The intro APR, which applies to both balance transfers requested within 60 days of account opening and purchases, lasts for 15 months. Although that’s not the absolute longest intro period you could find, it’s well above average. $0 balance transfer fee -- The Amex EveryDay® Credit Card from American Express has a key advantage over other balance transfer cards, because there’s no 3% fee on balance transfers (note that only balance transfers made within 60 days of account opening will be approved). When you’re trying to get control of credit card debt, every bit of savings can help. If you have $5,000 in balances to transfer, this card would save you $150. Earn up to two points per $1 -- This card will earn you two points per $1 at U.S. supermarkets, up to a maximum of $6,000 per calendar year, and one point per $1 on all other spending. 10,000 bonus points -- This welcome bonus requires just $1,000 of spending within the first three months after you open the card. American Express Membership Rewards® points can be worth upwards of $0.02 per point or more depending on how you use them, meaning this bonus is worth at least $100 in redemption value. 20% more points -- If you have at least 20 purchases in a billing period, you’ll receive a 20% points bonus on those transactions. Just be careful not to make unnecessary purchases to chase that bonus. No annual fee -- Cutting out-of-pocket costs is important, especially for cards in this category. Travel and purchase protections -- American Express includes some useful perks for being one of their cardholders. You get complimentary rental car insurance when you use this card to pay. When you purchase a product with your card, you’ll get return protection, coverage against accidental damage or theft, and extended warranty coverage if the product has an eligible warranty. Since credit cards are one of the main personal finance topics I write about, I frequently go over the terms and benefits of different cards to see what they’re offering. I’ve researched dozens of cards when writing about them here on The Ascent, and they’ve run the gamut from cash-back cards to travel rewards cards, and everything in-between. Like most Americans, I also use credit cards, although I carry many more than the average consumer. Through careful analysis and by managing cards correctly, I’ve built up a huge balance of rewards that I put towards free travel. Bonus categories -- Rewards aren’t the focus on this card, and the limited bonus categories beyond U.S. supermarkets are proof of that. If you want to earn the most possible points, there are plenty of cards with better rewards rates. 2.7% foreign transaction fee -- It could get costly to use the card outside the country. the length of the 0% intro APR period. You will need to do some math here, as it’s important to have a realistic estimate of how quickly you can pay off your transferred balances. If you need as much time as possible, then it makes sense to get whichever card has the longest intro period. On the other hand, if you’re confident you can pay everything off within 15 months, then The Amex EveryDay® Credit Card from American Express would be ideal because there’s no balance transfer fee. the type of rewards a card earns. 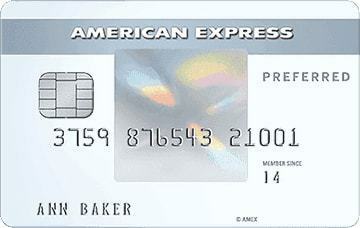 The Amex EveryDay® Credit Card from American Express does well in two out of four areas. No annual fee is as good as it gets, and it earns Membership Rewards® points, which you can send over to 19 different airline and hotel transfer partners for travel and redeem for many more options. The rewards rate and welcome bonus aren’t the biggest, but they’re still respectable given the card’s many other benefits. a 15,000-point welcome bonus after spending $1,000 in three months. three points per $1 at U.S. supermarkets, capped at $6,000 per calendar year. two points per $1 at U.S. gas stations. one point per $1 on all other spending. 50% bonus points when you use the card at least 30 times in one billing cycle. Despite the similarity in their names, these are two different types of cards. The Amex EveryDay® Credit Card from American Express is a balance transfer card that also earns rewards. The Amex EveryDay® Preferred Credit Card is more of a rewards card that also has a (shorter) 0% intro APR offer. Earn 15,000 Membership Reward® points after you use your new card to make $1,000 in purchases in your first 3 months. 3 points per dollar at US supermarkets on up to $6,000 per year in purchases (then 1 point per dollar after); 2 points per dollar at US gas stations; 1 point per dollar on other purchases. Terms and limitations apply. You can use Membership Rewards® Pay with Points to pay for all or part of your flight, hotel booked and paid in advance, vacation or cruise booking through amextravel.com. 0% introductory APR on purchases and balance transfers for 12 months, then a variable rate, currently 14.74% to 24.74%, based on your creditworthiness and other factors. The card is intended for people with good to excellent credit. A FICO® Score of 670 or higher will put you in a good position when you apply for The Amex EveryDay® Credit Card from American Express. Your income is also a crucial factor when you’re getting a balance transfer card. Not only does it affect your approval odds, but American Express will use it to determine your credit limit, and you’ll need a limit that’s high enough to handle the transfers you may have planned. you plan to transfer credit card debt that you can pay off within 15 months. you want a no-annual-fee rewards card. you use your credit card at least 20 times per month and concentrate your budget at U.S. supermarkets. If you think it will take more time to pay off your debt, then you should consider other balance transfer cards, because there are a few with intro periods from 18 to 21 months. I’d also recommend looking over your options if you’re interested in travel rewards. Although most travel rewards cards will carry annual fees, they also include higher rewards rates and perks compared to The Amex EveryDay® Credit Card from American Express. The Motley Fool recommends Amex. We’re firm believers in the Golden Rule. If we wouldn’t recommend an offer to a close family member, we wouldn’t recommend it on The Ascent either. Our number one goal is helping people find the best offers to improve their finances. That is why editorial opinions are ours alone and have not been previously reviewed, approved, or endorsed by included advertisers. Editorial content from The Ascent is separate from The Motley Fool editorial content and is created by a different analyst team.